We invite you to pull up a chair as we experience the intimate art of food this summer. 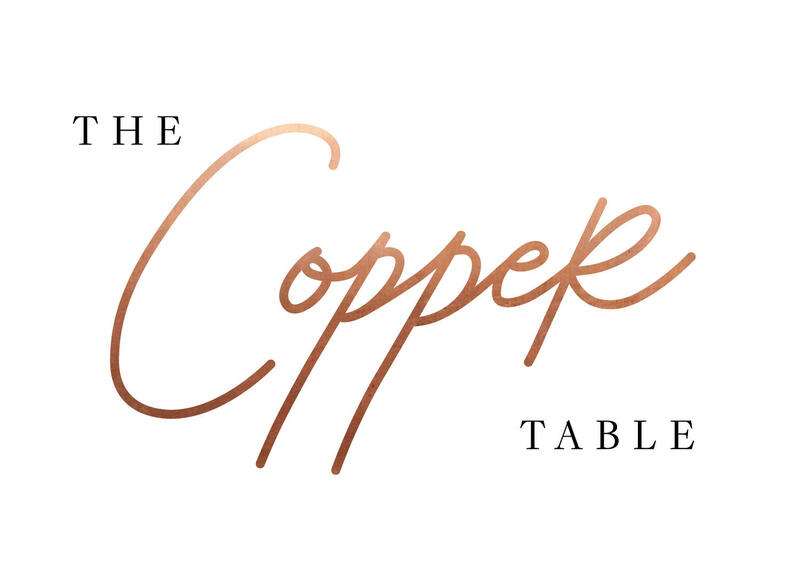 Gather with us for The Copper Table: a three-part summer pop-up supper series. Each dining experience crafted differently from the last, highlighting the unique perspective of our featured chef of the evening. 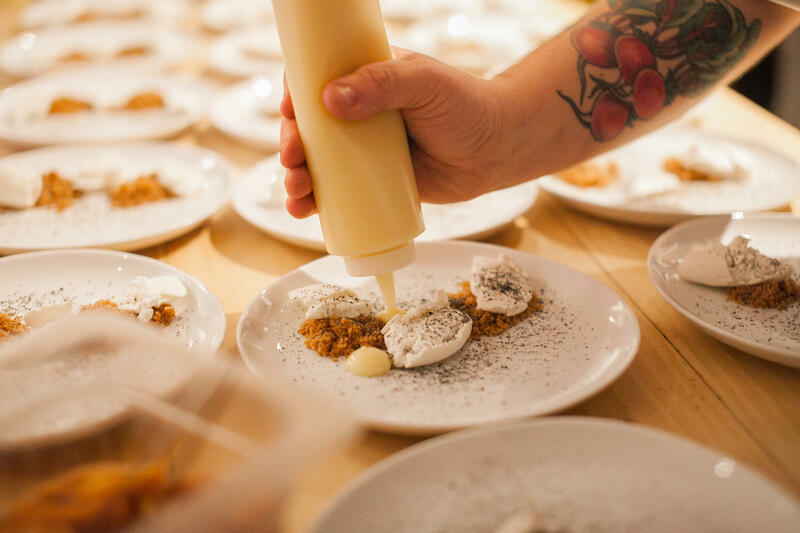 With the powerful vision of bringing together the local creative community — chefs, musicians, makers, visionaries, and foodies — you're in for an unforgettable dining experience. presented by Tito's Handmade Vodka. We're doing things a little different this time around. Dive in with us for our second dinner in The Copper Table summer supper series — an up close and personal tasting with our featured Chef Drew Curren, representing an Austin favorite — Italic. With a seat just for you at our signature 13ft. marble top bar. Chef Drew Curren is crafting up an intentional, sensational menu for the evening that you won't want to miss. Our hope? You'll connect with the food just as much as with the people around you — and of course you'll experience handcrafted Tito's cocktails designed specifically for the evening's incredible menu. Our mouth's are already watering. Dive in with us for our second dinner in The Copper Table summer supper series — an up close and personal dinner with featured Chef Drew Curren, representing an Austin favorite — Italic. We have a spot at our signature 13ft. marble top bar picked out just for you. Our hope? 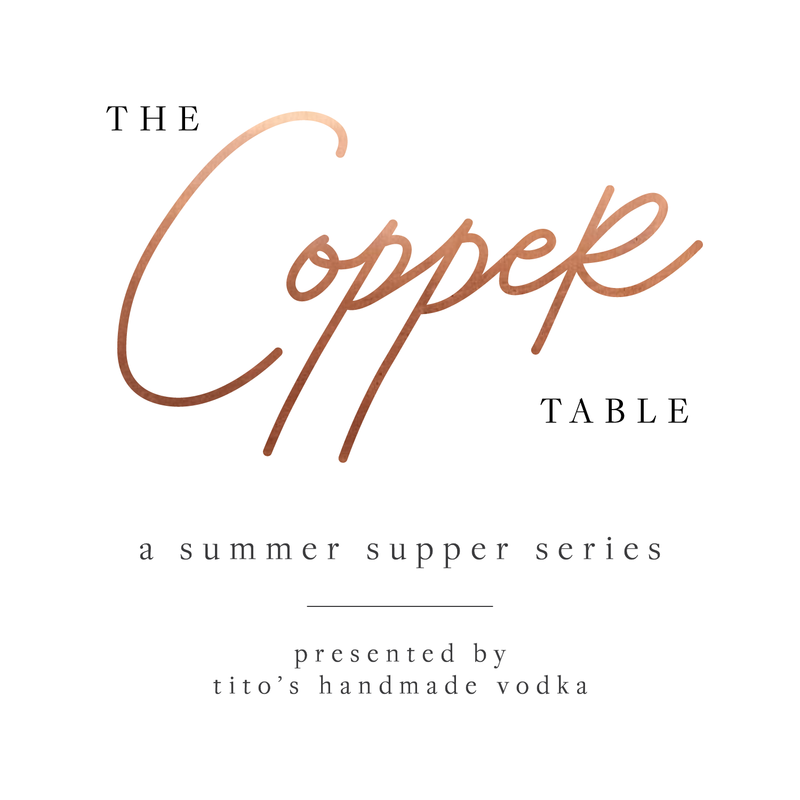 You'll connect with the food just as much as with the people around you — and of course it wouldn't be The Copper Table without handcrafted Tito's cocktails designed specifically for the evening's incredible menu. is a graduate of Texas A&M University and a valedictorian graduate of the Culinary Institute of America in New York. He worked with internationally renowned restaurateurs Danny Meyer and Jonathan Waxman while in NYC over a seven-year period, where he helped develop Barbuto and Madaleine Mae. He studied culinary arts and interned in Italy, Vietnam and Mexico. Drew is a two-time nominee for Food & Wine’s “People’s Best New Chef,” competed on “Top Chef: Texas” and is included in multiple editions of Best Chefs America. Grab a seat for dinner two at our signature 13ft. marble top bar. Chef Drew Curren is crafting up an intentional, sensational menu for the evening that you won't want to miss. Our hope? You'll connect with the food just as much as with the people around you — and of course you'll experience handcrafted Tito's cocktails designed specifically for the evening's incredible menu..
We're doing things a little different this time around, but only in the best of ways. Dive in with us for our second dinner in The Copper Table summer supper series — an up close and personal dinner with featured Chef Drew Curren, representing an Austin favorite — Italic. Seats are very limited, so grab one quick! Thirty guests joined us for a magical sit-down dining experience marked by simple florals, gorgeous greenery, and copper accents. The menu, carefully designed by the talented chefs of The Peached Tortilla — Eric Silverstein, Edgar Rico & Ryan Rosen — was adorned with fresh heirloom tomatoes, mapo pork bolognese, shishito kasha quail, and oh so much more. Apart from the incredible dishes that graced their palettes, guests got to enjoy two handcrafted Tito's cocktails, refreshing Richard's Rainwater, and the sultry ballads of the captivating duo behind Naala. We couldn't have asked for a better team of visionaries and artists to make dinner one one for the books. Recap now on the blog! Urban Roots is a youth development organization that uses food and farming to transform the lives of young people and inspire, engage, and nourish the community. As the only farm-based youth leadership organization in Austin, Urban Roots is uniquely positioned to be a catalyst of change for the larger community. They believe that empowered youth can nourish our community in so many ways, and are thrilled to be celebrating 10 years of successful work in the city of Austin, Texas. Canvas, the event space at The Refinery, blossomed out of a need for an intimate, care free & creative event space in the heart of downtown Austin. Our building is rich in history and carries a modern, clean aesthetic carefully designed to host all the celebrations. White brick, sleek copper & marble make for timeless entertaining. Built around human connection, Canvas was designed for intimate rehearsal dinners, weddings, creative conferences & speaker events, cocktail parties and all of life's reasons to celebrate.